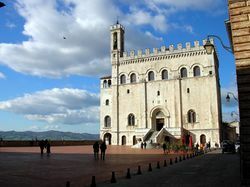 Gubbio is a lovely small walled medieval city in Umbria in central Italy. It is located to the northeast of Perugia on the slopes of Monte Ingino. The city's history dates back to the Pre-Roman era. In a country well-served by railways Gubbio is unusual in that the closest station, on the Rome-Ancona line, is 18km away at Fossato di Vico station. There is a bus service from there. An alternative is to take the train to Perugia and take a bus from there (40km). If coming from the north coast (e.g. if you were driving down the coast from Venice) leave the A14 Autostrada at Fano. From the north on the A1 Autostrada, exit at Arezzo. From Rome and the south exit the A1 at Orte and follow signs to Perugia and then to Gubbio. The airport at Perugia  has flights from Milan and London Stansted. Within the walls, traffic is restricted, so be prepared to walk, if you are physically able. The Funivia. This is a very basic cable car in which you stand in a two-person cage. It takes you from the center, near Porta Romana, up to the Basilica of St. Ubaldo. Palazzo dei Consoli. Built in 1332‑1337, this is an impressive public building. It required tremendous engineering work to create a large enough flat space on the side of a hill in order to construct the Palace, which together with the Piazza della Signoria in front of it, was erected on a massive arched structure. Hotel Tre Ceri di Gubbio Via Benamati 6. +39.075.92.22.109  Entirely restored in 2001 the hotel Tre Ceri is composed of two buildings from around the 14th century near via dei Consoli. Castello di Petroia Hotel, Localita' Petroia - 06020 Scritto di Gubbio. Situated on a strategic location between Gubbio and Perugia overlooking the Chiascio valley. Petroia Castle has been the scene of many important events of the 12th to 14th centuries. €110-250 for a double. This page was last edited on 15 February 2016, at 09:58.